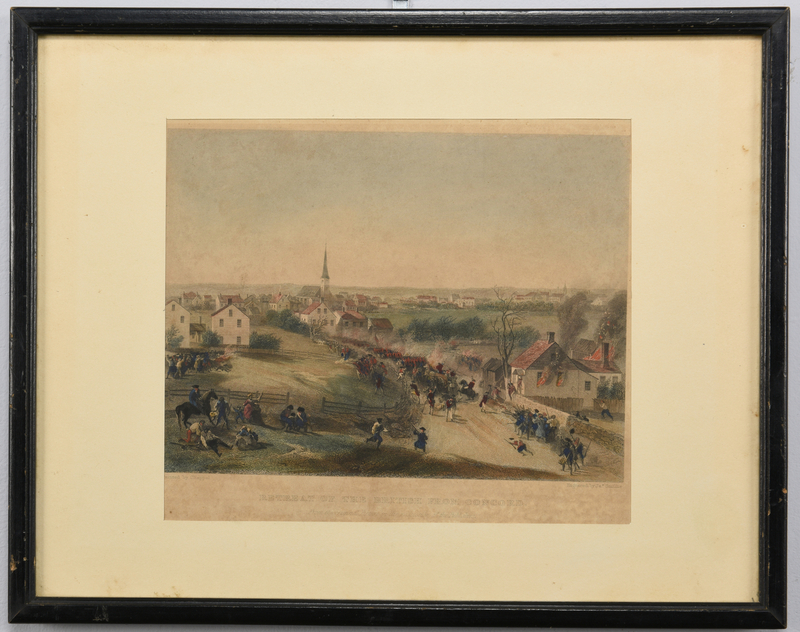 1st item: Late 19th/early 20th century Centennial reprint of "A View of Part of the Town of Boston in New-England and Brittish [sic] Ships of War Landing their Troops! 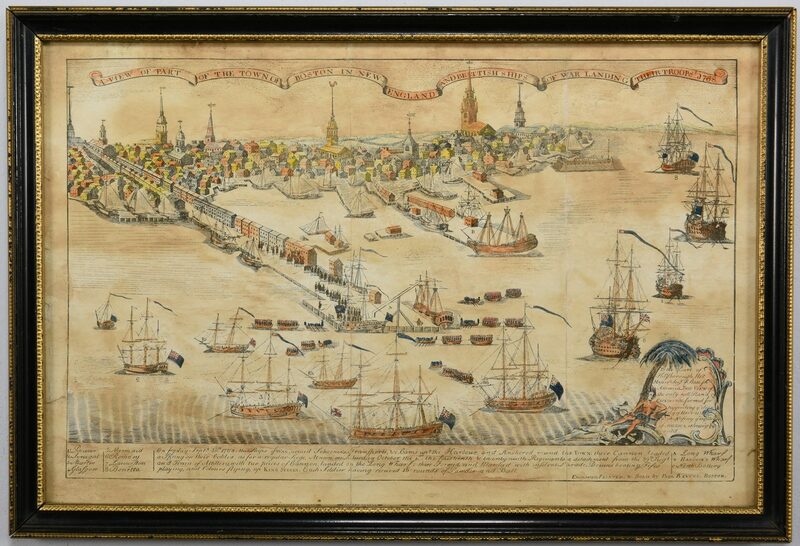 1768", original engraved and printed by Paul Revere, Jr., Boston, 1768. 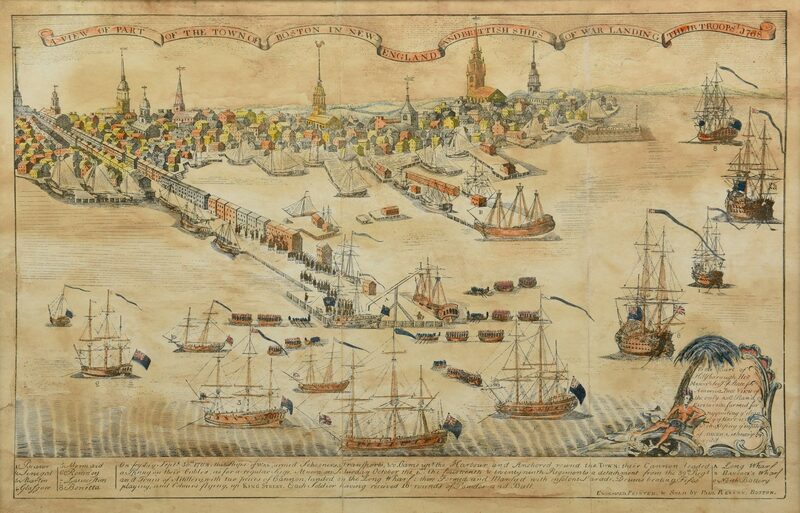 Propaganda image depicting the British ships in the Boston harbor. 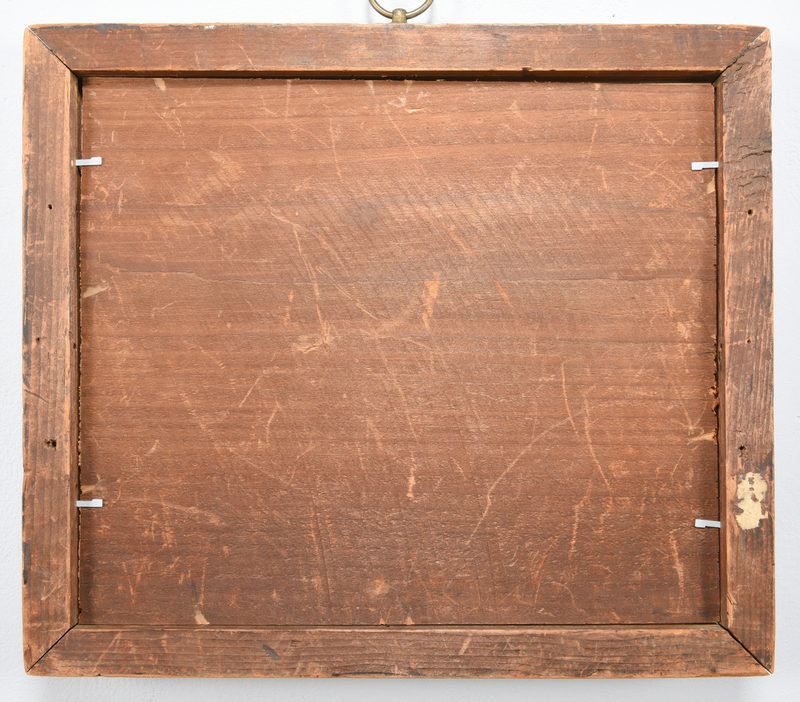 Housed in a contemporary frame. 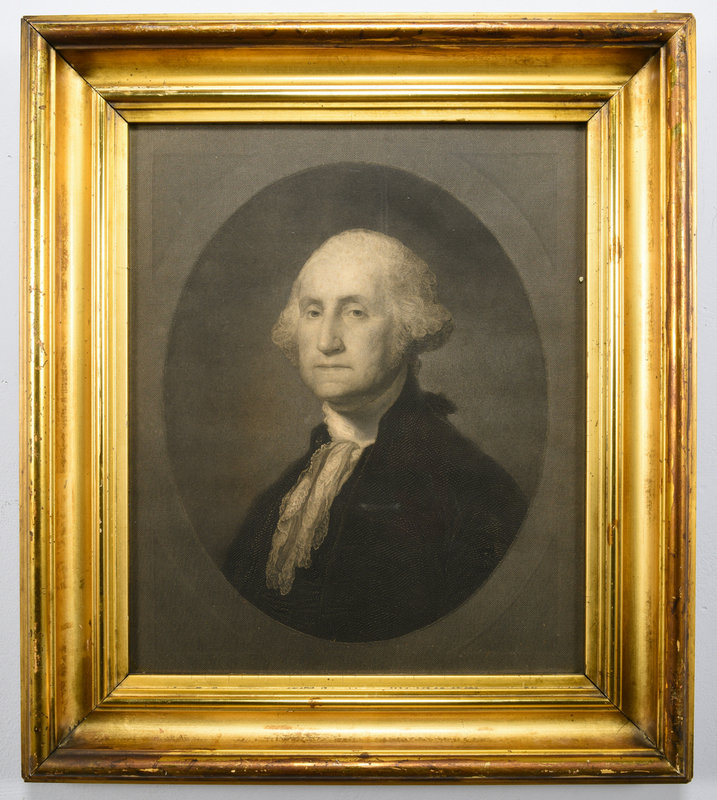 Sight – 10 5/8" H x 16 1/4" W. Framed – 12 1/4" H x 17 3/4" W. 2nd item: "George Washington" engraved by William E. Marshall after a painting by Gilbert Stuart, published by J.B. Ford and Company, New York, 1862. Issued as a subscriber's print for "The Christian Union" newspaper, edited by Henry Ward Beecher. 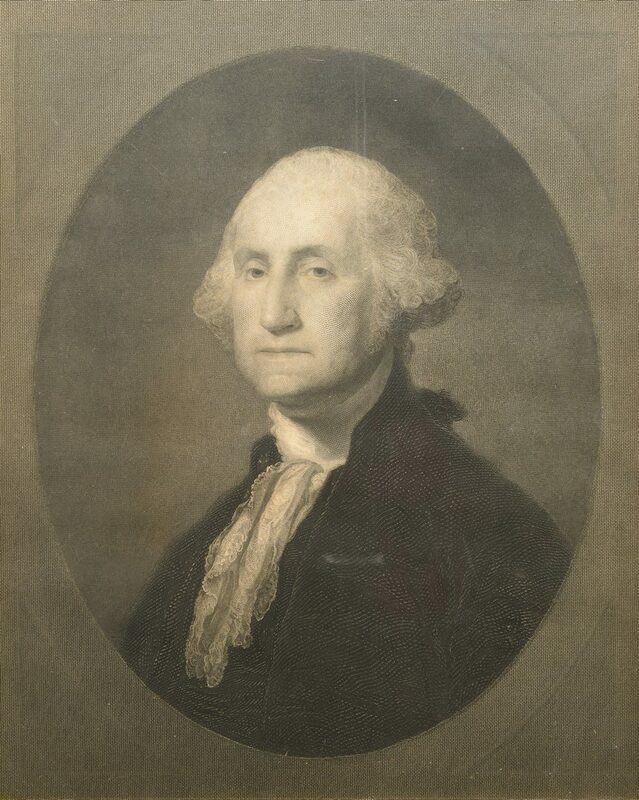 Steel plate engraving depicting the first president of the United States. 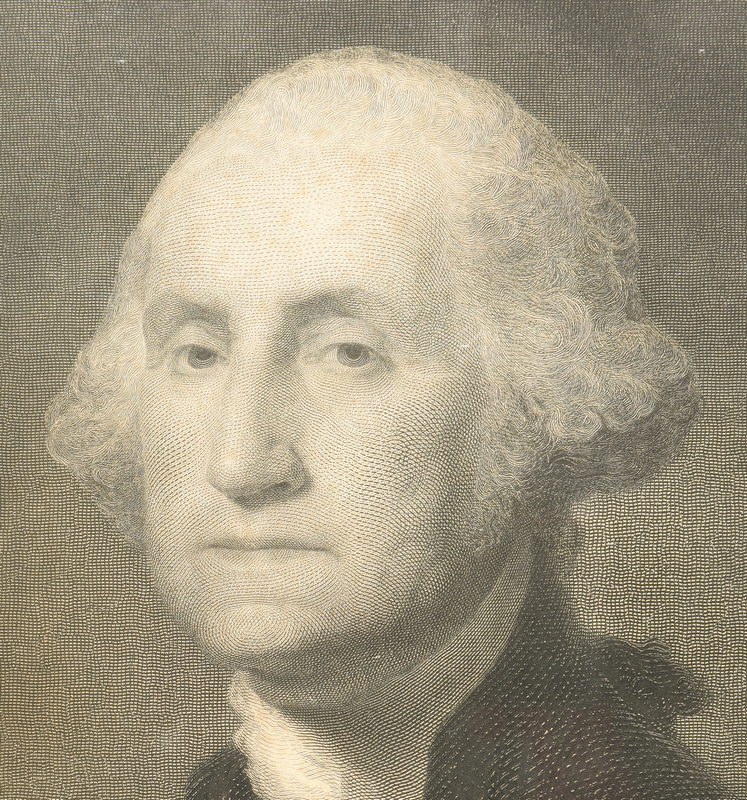 Housed in a gilded frame. 12 7/8" H x 10 3/4" W. 3rd item: "Retreat of the British from Concord" engraved by James David Smillie after a painting by Alonzo Chappel, published by Johnson, Wilson & Co., Publishers, New York, circa 1874. 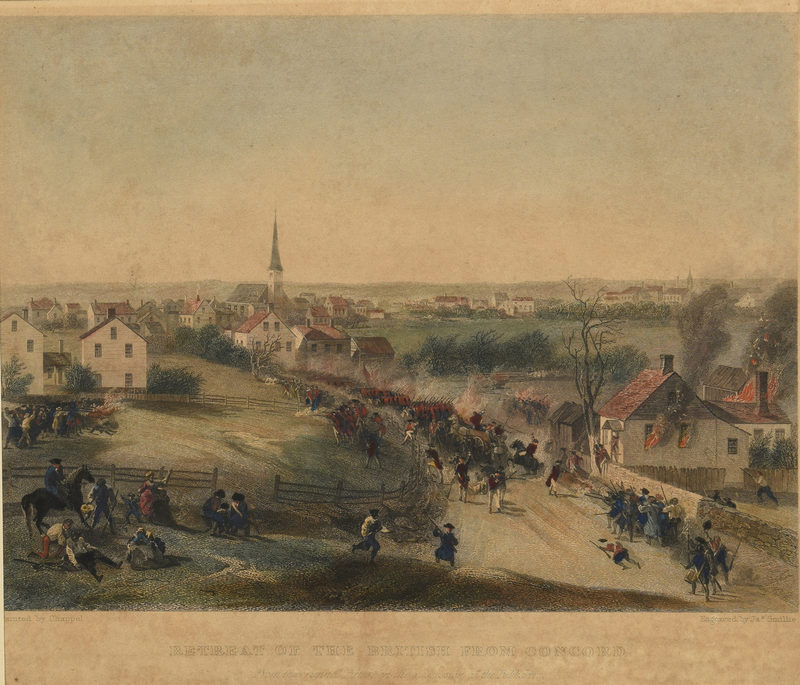 Copper plate engraving with hand coloring depicting the British troops retreated from the town of Concord, Massachusetts during the Revolutionary War. Housed in a contemporary wooden frame. 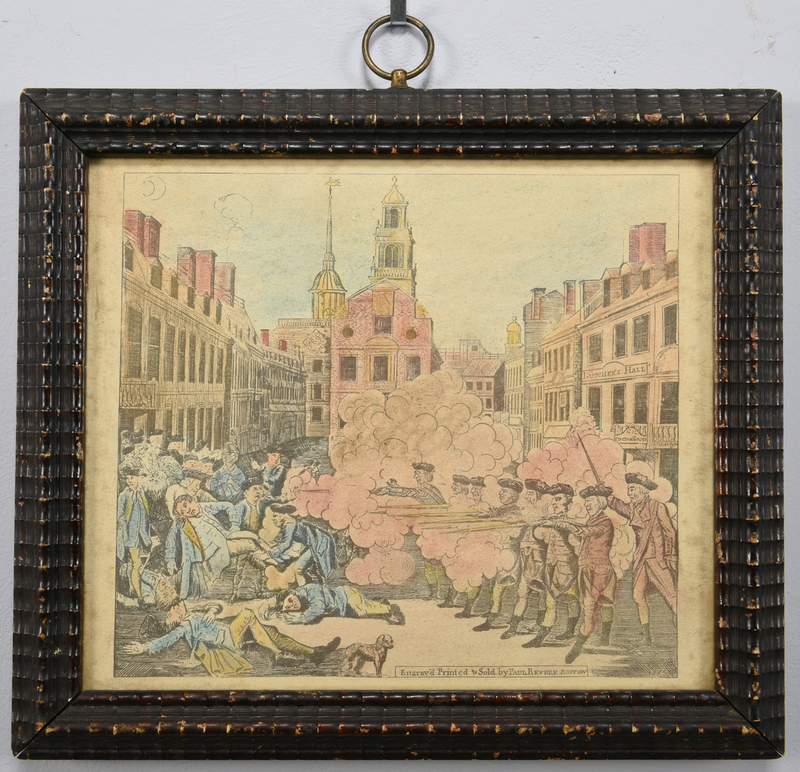 Sight – 6 1/4" H x 7 1/4" W. Framed – 9 5/8" H x 12 1/8" W. 4th item: Late 19th/early 20th century Centennial reprint of "The Bloody Massacre", original engraved and printed by Paul Revere, Jr., Boston, 1770. 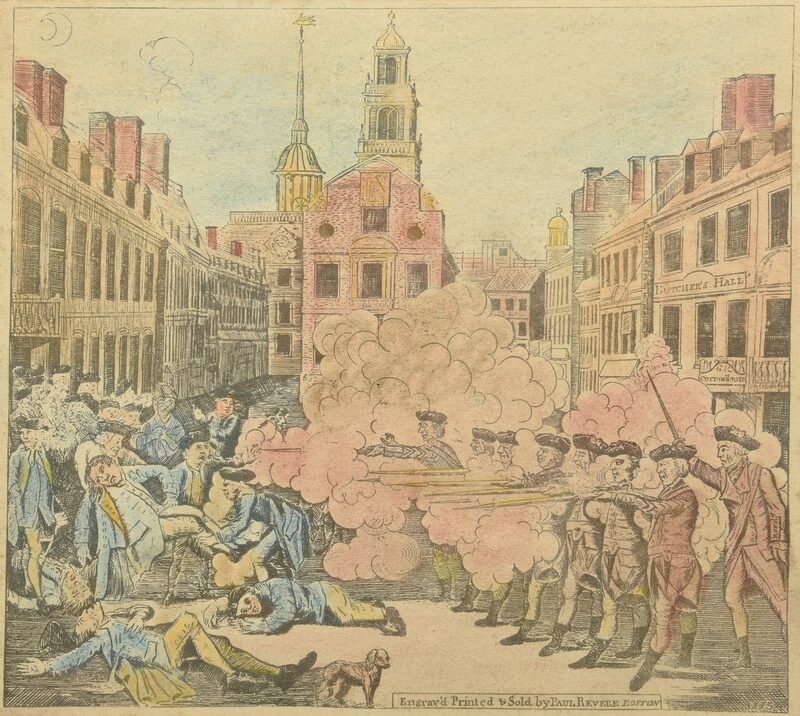 Propaganda image depicting the events of the Boston Massacre. Housed in a contemporary wooden frame. 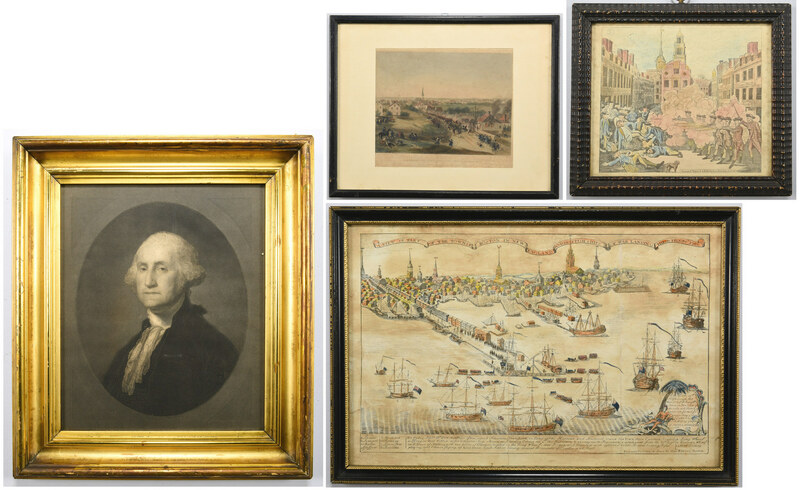 Sight – 8 3/8" H x 9 7/8" W. Framed – 10 1/2" H x 12" W. All items 19th/early 20th century. 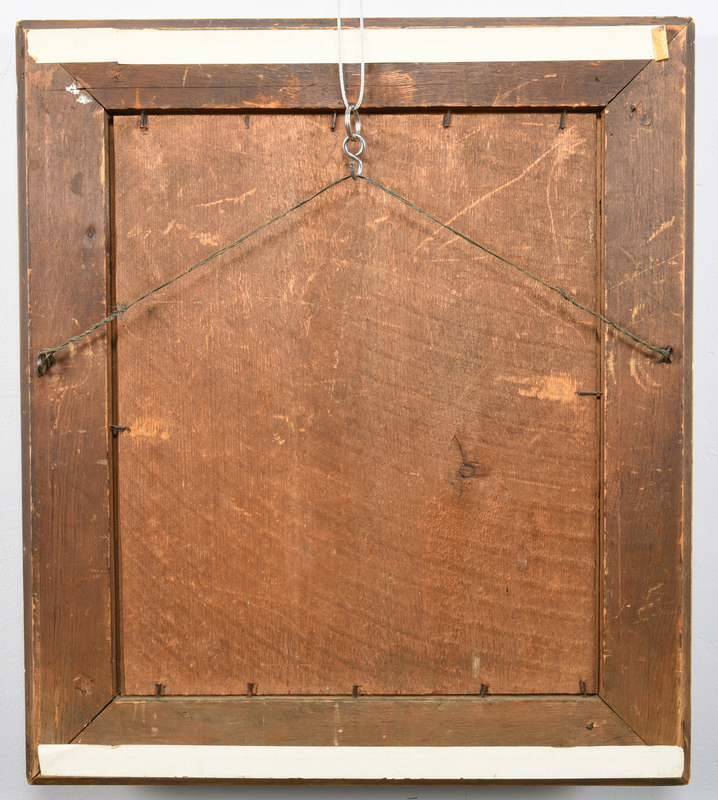 Provenance: East Tennessee collection, by descent from Col. Edwin V. Hill, M.D., deceased 1969. CONDITION: 1st item: Heavy foxing on sheet. 2nd item: Heavy foxing on sheet. 3rd item: Overall excellent condition. Not examined out of frame. 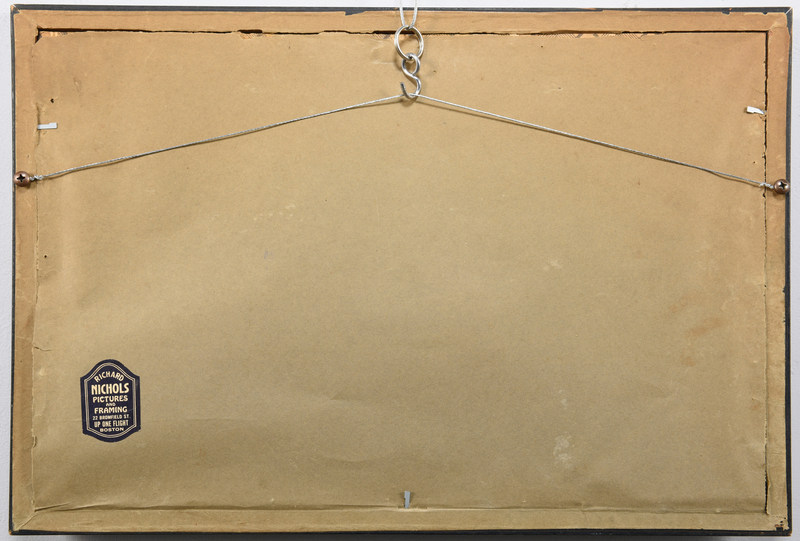 4th item: Heavy foxing on sheet. Not examined out of frame.